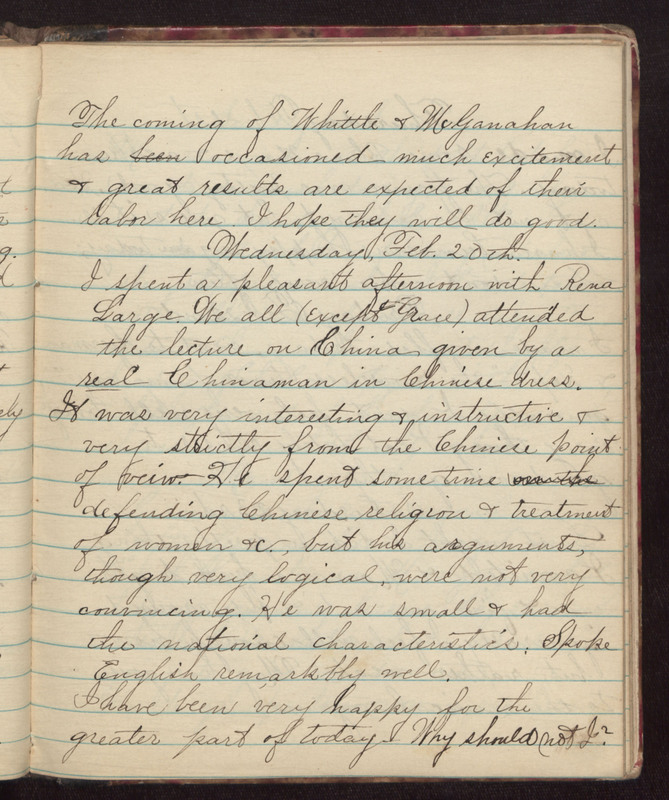 The coming of Whittle & Mc Ganahan has occasioned much excitement & great results are expected of their labor here. I hope they will do good. Wednesday, Feb. 20th. I spent a pleasant afternoon with Rean Large. We all (except Grace) attended the lecture of China given by a real Chinaman in Chinese dress. It was very interesting & instructive & very strictly from the Chinese point of veiw. He spent some time defending Chinese religion & treatment of women &c., but his arguments, though very logical, were not very convincing. He was small & had the national characteristics. Spoke English remarkbly well. I have been very happy for the greater part of today - Why should not I?